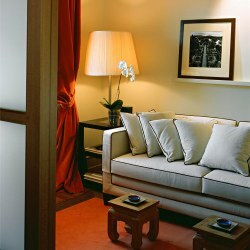 Ultimate Escapes, has added a new Elite Club residence within the Lungarno Suites in Florence, Italy. Featuring views of the medieval Ponte Vecchio bridge arched over the Arno River. "This spectacular Elite Club property in the Lungarno Suites in Florence helps to further round-out our international destination collection," said Jim Tousignant, CEO and president of Ultimate Escapes. "The art, culture and history of Florence make it a very special addition to our portfolio. Our members now have a place they can call home in this spectacular city." Located on Lungarno Acciaiuoli, next to Ponte Vecchio, one of Europe's oldest bridges, the Lungarno Suites are dedicated to providing guests with the comforts of home without giving up the services, amenities and comforts of a luxury hotel. The Elite property features 2 bedrooms, 2 baths, and more, all within a well-designed layout. The suite's expansive windows showcase the splendors of the city creating a striking experience of incomparable light and beauty, providing magnificent views of Florence and Ponte Vecchio, as well as unforgettable sunsets. "Lungarno Hotels and Lungarno Suites are committed to offering visitors an experience that conveys hospitality, elegance, sensitivity and culture  values that mirror the foundation of our family business," said Leonardo Ferragamo, chairman of Lungarno Hotels. "Ultimate Escapes' members are an ideal fit for Lungarno Suites given their commitment to quality time with loved ones. We are thrilled to offer them these quintessential values native to our Italian character." As with every Ultimate Escapes experience, all conceivable comforts will be available to members. Features and services include reception service 24 hours a day, housekeeping service twice a day, concierge, laundry service, free high speed Internet, satellite TV, CD player, DVD player, A/C and more. On request services include limousine, valet parking and video conference systems. Members of Ultimate Escapes will also enjoy access to other Lungarno Hotels facilities in the heart of Florence including free use of the gym in the Continentale, invitations to exhibitions in the Gallery Hotel Art, special facilities and services at Lungarno Details Store, and special services at Borgo San Jacopo Restaurant, the Fusion Bar & Restaurant, Bar & Sky Lounge Continentale and Lounge Bar Lungarno. Equity Estates also recently added a two bedroom residence in Florence overlooking the Ponte Vechio. Several destination clubs, including Quintess, Hideaways, Ultimate Escapes and Exclusive Resorts have homes in Tuscany, which makes a fabulous base for day trips into Florence, Siena and Pisa.